I am often asked questions like, “What was the first…” or “Who was the first…” I am sorry to say that too often the answer is that I really don’t know. True firsts are pretty tough to nail down. This posting is about one of those true firsts, the first QB for a Wabash football team – William K. “Billy” Martin [W1887]. 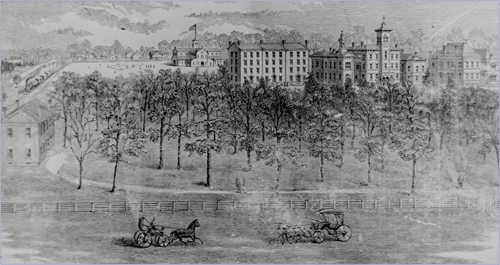 A local boy, Billy entered Wabash in 1881 as a prep student. He studied for two years learning his Latin and Greek and in the fall of 1883 entered as a freshman with the class of 1887. A Sigma Chi, Billy loved sports and played the only organized sport at Wabash at that time, baseball, and was the captain of the team. In 1884 there were selected 11 men to represent Wabash against other teams. This team went to Indianapolis to play Butler and beat them 4-0 in front of a crowd of about 20 supporters. As no other school was playing this sport, Wabash had the championship. The next year no other schools played this sport so we kept the title. 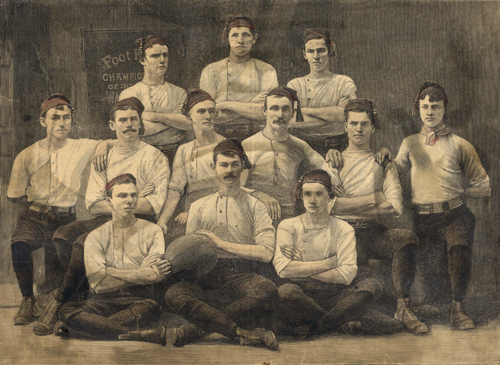 1886 was the year that modern style American football arrived in Indiana. The Indianapolis Athletic Club organized to promote sports, especially football, in Indiana. They created a league with Wabash, Hanover, Indiana University, Butler and Franklin as the first schools. League rules were that all games would be played in Indianapolis. The Athletic Club would cover the expenses and receive the gate receipts. Lose once and the team was out of the running for a championship, the last team standing undefeated won. The Wabash team practiced their game, but rumors started that the new style of football – rugby – was being played at other schools in Indiana. The first game was against Franklin and when our Wabash men arrived in the morning, they were told that the game to be played that day would be the new football. A Yale man, friend of Wabash, and future Trustee, Evans Woollen came forward to help our guys learn this new game. The remainder of the morning was spent practicing and in the afternoon the Wabash team took the field against Franklin and played to a 4-4 tie. With their new yell and wearing their scarlet ribbons, the Wabash football team returned to Indianapolis to “play-off” the tie with Franklin and won, 8 to 4. When the team arrived back in town, a great celebration ensued. The last game of the 1886 season was with Hanover and we won easily, 23 to 4. Following the rules of the league,. As we had beaten both Franklin and Hanover – who had beaten Butler – who had beaten Indiana, Wabash won the championship. So who was this captain and quarterback of this first true football team? The same student and player who uttered those now famous words, “Heliotrope Hell! We want blood!” Billy Martin!